CalBug Expeditions is online! Welcome to the Wood Boring Beetle Campaign. Welcome everyone, to a CalBug expedition exploring part of one of the most stunning groups of beetles, the jewel beetles. We have pulled together a set of 15,416 images of these beetles from the holdings of the CalBug institutions to be transcribed. The data from these specimens will help us better understand where the beetles live, their habitats, ecology, and other fundamental data for researchers working on the group. 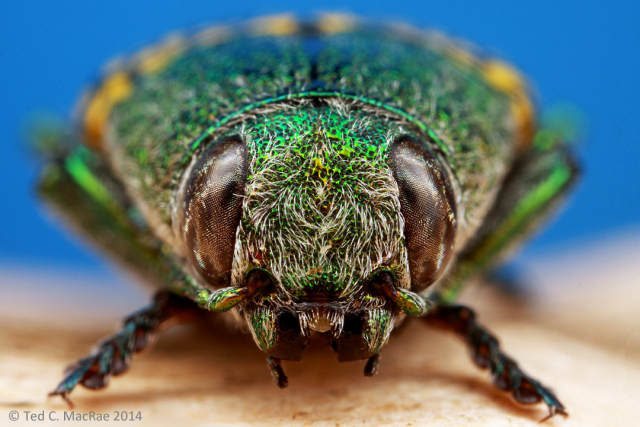 The family Buprestidae, are also commonly called “metallic wood boring beetles,” but this captures only one of the life histories found in the group. Many are herbaceous plant stem-borers or leaf-miners. Some feed on living trees, while others on dead or dying trees. Some are well-known fire followers, showing up in vast numbers while the logs are still smoldering after a wildfire. Jewel beetles have a life history that includes eggs laid by the female on a host plant, larvae that feed on the host plant and, a pupal stage where the very plain, grub-like larva transforms into the ostentatious adult. Many adults are not frequently seen unless one is specifically looking in places they hide. However, there are some that are conspicuous on flowers during the day, where they feed on pollen. At least some of these species are capable pollinators, assisting bees and flies with that important work. When it comes to natural beauty, many jewel beetles, rival or surpass birds and butterflies. Their stunning colors make them pure entomological eye-candy. Their color patterns have been the inspiration for art and their shiny metallic bodies have been used in art and jewelry itself. Though adults have the looks, it’s the unassuming, grub-like larvae that have the greatest economic impact. When they are a larva they can feed on a wide range of agricultural, ornamental, and forest trees. In North America species like the Emerald Ash Borer and Goldspotted Oak Borer have been introduced or are spreading and now causing serious damage, sometimes killing trees. It’s important for scientists, foresters and control managers to have information on the distribution of these species, both native and introduced, so that harmless native species can be protected and potentially harmful species can be managed. This expedition focuses on two subfamilies of jewel beetles, Agrilinae and Buprestinae. Your transcription efforts will be a critical part of this expedition’s goals to transcribe a major collection – 15,416 imaged specimens. Thank you!